In order to treat a disease efficiently and successfully, a good diagnosis is a must. Therefore, we have to identify the process of our project aiming this year, the degree of the problem and how people reacts against. Thus, our approach begins with the identification module to evaluate and describe the problem and its aspects from the view of health sector and social lives of people. During the brainstorming session, we decided that performing a survey would be the best solution to determine the parameters and to obtain significant data among our environment and iGEMers. To do this, first, we researched the basics of our approach such as which parameters should be taken into consideration, how we analyze the statistics and what kind of scale we should use to determine the degree of the problem recommended by the experts. The researches demonstrated that daily calorie intake and weight gain is associated with high risk of heart disease. Especially, the obesity and its associated disease, diabetes, is the number one cause of deadly heart attacks. Additionally, high blood pressure may predispose a vulnerable heart tissue and accelerate this condition. The sodium in salt, together with potassium, is necessary to maintain a good water balance in the body. Too much sodium in the body, caused by a high salt intake, leads to high blood pressure. Because of this, salt intake considering its major role on causing high blood pressure and daily calorie related with fat consumption can be regarded as possible targets to be evaluated. From these aspects, we evaluated two distinct parameters among the attendees of our survey; their daily salt intake and weekly food consumption according to their daily meals. You can see a sample of our survey down here. Each of the basic foods an ordinary person would eat in daily meals is defined with its specific calorie ingredient. We asked from each attendee to choose what he/she is having in a week to measure how much calorie is gained, approximately. Additionally, we requested from attendees to note their body length and weight, daily physical activity (by classifying the activity into five groups as stationary, languish, monotone, sprightly and hyperactive, respectively) to be able to measure their basic metabolic rate (BMR) according to their individual body parameters. We need to calculate it to use in the Harris-Benedict equation. After the determination of the questions, we performed our survey as leaflets in our university. An online version of the survey is also declared via iGEM Community and our team’s Twitter profile. (Click for ATOMS_Turkiye twitter profile) In these ways, we reached 250 people in general and 17 teams in iGEM. We investigated how much salt a normal person or an ordinary iGEMer consumes and their daily calorie intake. Obtained data hopefully would give us an idea about the risk of gaining weight or being obese in the future which is also related with heart disease risk. 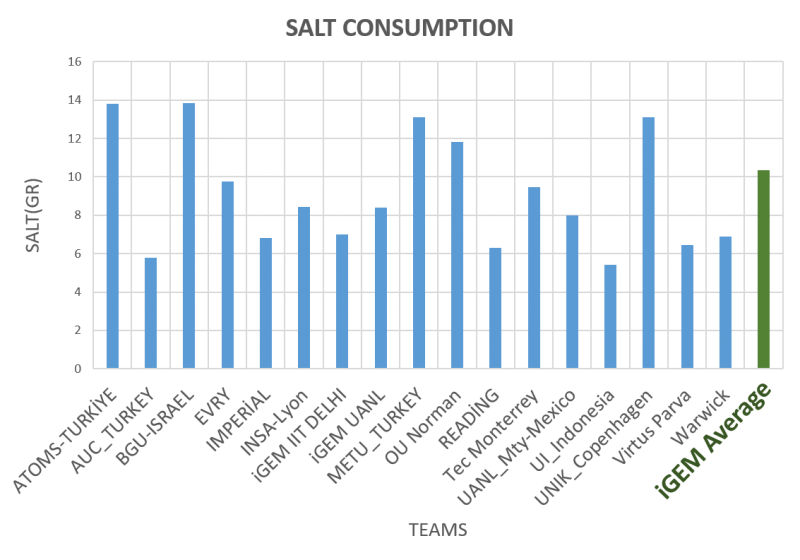 As it is expected, our results show that there is an uncontrolled imbalance in salt and calorie intake among the youths of our university and iGEM. Normally, daily salt intake must be restricted to 6 milligrams. Additionally, the basal calorie need of a normal person is estimated due to the Harris–Benedict equation with respect to attendee’s information given in the survey. According to our results, daily salt uptake of iGEMers is above the normal rate, 6 milligrams, which shows the unhealthy nourishment and risk for cardiovascular disease. For calorie uptake, we measuered the avarege value of necessary calorie intake of an individual, shown in the table below sorted by teams. 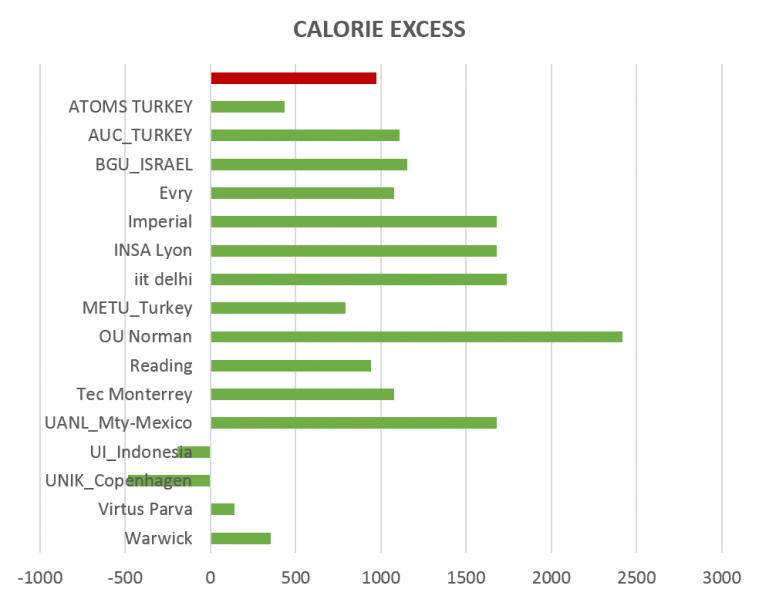 Then, we calculated the calorie excess of each team relating to it. Here we can demonstrate that some teams excess their optimal consumption rate which must also alert ourselves. Unfortuanely, the mean avarege value of an iGEMer is excessed abundantly. From these results, we can conclude that salt consumption must be under control to reduce the risk. Moreoever, we investigated if there is an association between an individual’s weight and daily calorie uptake. To evaluate this, we calculated the body mass index (BMI) of each of the participants by using their weight and length. BMI is frequently used in clinic to determine an individual’s nourishment situation. Here we can see that there is a strict association between BMI and calorie uptake which demonstrates a positive feedback loop presenting that individual consumes more food as he/she continues to gain weight. This is a real problem which must be prevented with strict regulations in order to avoid heart disease. Which one of the following statements best describes your usual weekly physical activity? Have your parents, siblings or children had any of the following at an early age (younger than age 55 for men and younger than age 65 for women)? As a conclusion, we can say that, in general, daily nourishment is on-going unhealthy and it is increasing our risk of gaining heart disease. Especially, the mean values of salt and calorie intake among iGEMers must alert us to take action towards it. We can definitely state that we have to inform people on how the salt and calorie being consumed unnecessarily affects our health and how we can reduce their uptake.